Posted on 11 Apr 2019 / Noelle Cesario, L.M.E., C.L.T. It’s estimated that 1 billion people worldwide are not getting enough of this essential nutrient. Your health and your skin crave this delicious vitamin, lovingly referred to as the ‘sunshine vitamin’. And while excessive sun exposure, especially without proper protection, can do damage to your skin, your body can also suffer if you’re deficient in Vitamin D. It can be especially hard to make sure you’re getting enough Vitamin D during the dark winter months, or during Arizona summers (that are brutal enough to keep you indoors). In addition to supporting the function of our internal organs, Vitamin D supports our skin health, which means a deficiency can be a real beauty killer. It’s important to educate yourself on the role Vitamin D plays on your skin health, and find ways to consume or absorb enough of this essential beauty nutrient. Even under the best weather conditions, it can be difficult to soak up enough Vitamin D from the sun. Luckily, there are other ways you can consume it to avoid becoming deficient, such as certain types of food (egg yolks, cheese, soy milk, tuna, salmon, mackerel) and vitamin supplements. Vitamin D is essential for proper function of nearly every tissue in the body, including the brain, heart, muscles, immune system, and skin. Below is a breakdown of the role Vitamin D plays in chronic skin issues, such as eczema, acne, and sun damage. The exact cause of eczema is still unknown, but it is thought to be a combination of genetics and environmental exposure. Those with the lowest levels of Vitamin D in their system have shown to have the most severe symptoms. 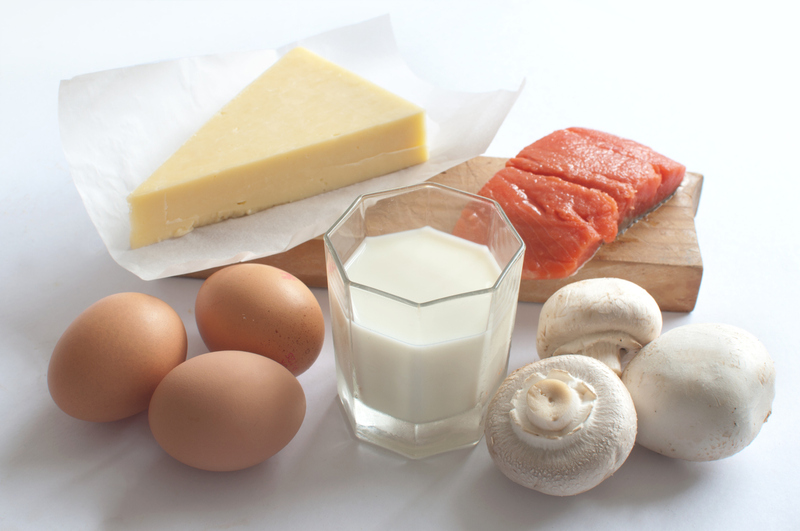 While a deficiency in Vitamin D isn't likely to be the cause of eczema, ensuring adequate amounts of the vitamin should be a part of the overall treatment plan. While there are several causes of acne, a poor immune system related to low amounts of Vitamin D can increase oil production in the skin cells. When these oil-producing cells become clogged, bacteria overgrow and cause acne breakouts. Vitamin D impacts these cells by producing proteins which have antibacterial properties and can reduce acne flare ups. Additionally, your strengthened immune system from a Vitamin D increase can also help your body fight acne. Photo damage, commonly referred to as sun damage induced by ultraviolet (UV) light, can lead to DNA damage, skin aging, skin cancer, and skin cell death. Studies show that when Vitamin D is applied topically to the skin, it has protective effects, including decreased DNA damage and reduced skin cell death. Skin aging consists of two independent factors - intrinsic and extrinsic skin aging. Extrinsic aging is mainly caused by UV exposure, smoking, pollution, sleep deprivation, and poor nutrition. Adding in a dietary antioxidant, such as Vitamins A, C, D, and E, has been shown to protect against photo damage and may even reverse the signs of aging. Because sun exposure is a skin ‘no no’, we have to find other ways to make sure we are getting enough of this essential beauty nutrient. One of my favorites is by eating delicious foods that are rich in Vitamin D.
Here’s one of my favorite recipes that includes two powerful Vitamin D ingredients: egg yolks and cheese. Preheat oven to 425 degrees F. Place cubed potatoes in a large bowl along with the zucchini, bell pepper, garlic, olive oil, spices, and salt and pepper. Arrange in a single layer in a baking pan and roast until potatoes are tender, about 25-30 minutes. Add corn and black beans to the potato mixture, stir together. Make 4 little wells in the pan, gently cracking one egg in each one, trying to keep the yolk intact. Sprinkle with shredded cheese, then season the eggs with a bit of salt and pepper. Place back in the oven and bake another 5-7 minutes until the egg whites are just set. The eggs will continue to cook once you remove the pan from the oven, so I recommend taking them out once the whites are just opaque. Remove from the oven and garnish with cilantro, if desired. Divide among four plates and enjoy! Vitamin D is only one of the things your skin needs to look beautiful. Keeping up with regular treatments with a licensed aesthetics professional is crucial to maintaining a youthful and healthy appearance. In addition to getting enough Vitamin D, make sure that you’re also getting enough skin TLC from a professional - both work together to create a fantastic environment for long-lasting, glowing skin. If you’re suffering from uneven skin tone, hyperpigmentation, acne scars, blemishes, or other skin concerns, schedule a complimentary consultation and I’ll assess your skin health and needs to create a customized treatment plan for your skin goals. Request a Complimentary Aesthetics Consultation with me today!